Black and white keys, each with a designated note in a designated place, all in a specific order. Each plays a specific note, and if it is out of tune, the rest sound “off” as well. Orderly, precise, and predictable is the design of the piano. The design is uniform, however, the ways the keys are played are as unique as each individual playing this instrument. The way I see it, we all are given some things that are the same..and we choose how to play it out. Some of us camp out in the minor keys. Some play fast and loud, and others slow and soft. Some stay in the mid range of the piano, and others span the scales from top to bottom. Sometimes there is great drama that comes forth in the mode and sound, like the sound of thunder or crashing wave. 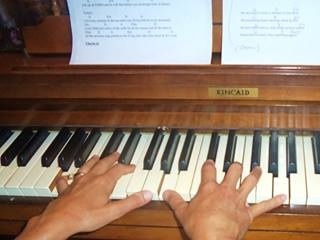 Other times, the keys are played in a manner that really does mimic a “twinkling star”. Beauty bursts forth in the way that these orderly and precise keys are played. The uniqueness of how they are played add to the wonder of the gift of music that demonstrates a song within. Love that we each have a “song” to play. Not on the piano, but in life. Sing your own song, not that of others. Play with the abilities you’ve been given and let that song be heard!